he Murray/Lohuis Duo performs original music for violin and organ and works for solo violin with orchestral accompaniment transcribed for organ. Their repertoire encompasses the 17th through 21st centuries, and unlike much music associated with the organ, is mainly secular. Together they have produced five recordings and are currently working on a sixth. When Robert Murray and Ardyth Lohuis first performed together in 1983, the great appreciation of their audience led them to search out repertoire for their unusual combination of instruments and to establish the only touring violin-organ duo. 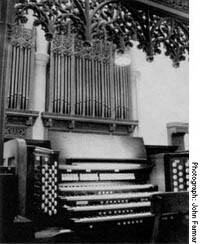 In addition to many performances on the East Coast, they have been featured artists at the College Music Society's annual convention in Santa Fe, N.M., Piccolo Spoleto in Charlestown, S.C., Organ Historical Society convention in Hartford, Conn., American Guild of Organists on several occasions and at the West Glamorgan Music Festival in Wales. In their programs, virtuoso violin pieces by Vitali, Vieuxtemps, Walther and Rheinberger are balanced with the Rococo elegance of Leclair, the Romantic expressiveness of Reger and Liszt, and works by American composers Sowerby, Foote, Blank, Held, Wikehart and Weiner in their programs. Murray/Lohuis Duo presentations have met with enthusiastic response wherever they have appeared. Beginning with the 1990-91 season, the Virginia Commission for the Arts included the Duo on its touring artists roster, enabling them to reach new audiences. Individually, the artists have a history of successful concertizing as soloists and ensemble performers.